I started this painting after a trip to Greenbrier Cove, North Carolina. It's a regular stop when I'm in the Smokies and always deserves a good day or two of solid hiking and sketching. 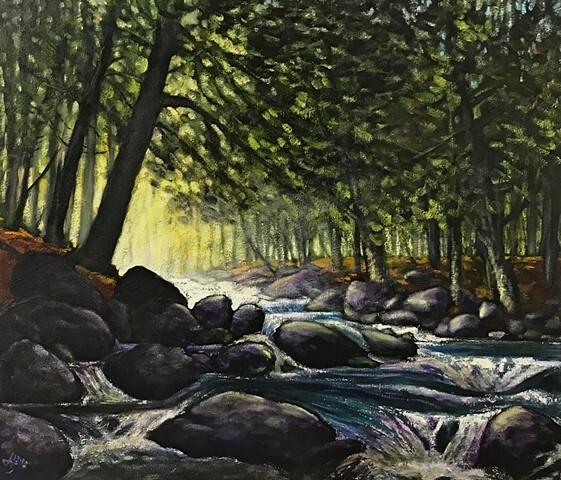 This particular painting was from a moment when I first pulled in early in the morning and there was a light fog down the creek and the yellow morning light was just palpable. I have had it hanging in my studio ever since I painted it in 2013 and always felt there was something just not quite right about it, I was missing the feeling that it gave me when I was there that morning. Funny thing about a moment like that, it sticks with you. Six years of having this painting on my wall, mulling it over, considering how I might adjust it, I stepped back into it and got it to that point where I saw the wonder of that morning in it. Finally.